One is a negative and hurtful behavior while the other is a more positive behavior and can be a source of a healthy relationship. This article explains the fine line that divides teasing and bullying. While bullying has no universal definition, it is widely accepted that it is an aggressive act characterized by hostile intent, a perceived imbalance of status or power, and habitual behavior. Thus, it can be inferred that bullying is forceful, abusive, threatening, and aggressive behavior with the objective of dominating others. The act of bullying is often habitual, especially if the behavior is left unchecked. Various studies conducted on bullying have come up with different findings and interpretations. Some researchers claim that resentment and envy are possible motives that may cause a person to bully others. There are experts who suggest that bullying others empowers the abuser or that it is a negative way to boost self-esteem or hide feelings of anxiety and insecurity. Bullies are also seen as arrogant and self-centered individuals who are disrespectful of others and easily offended by criticisms which they react to with aggression and insults. Bullies are also believed to have had difficulty controlling their emotions and aggressive behavior as children. Unhealthy family relations coupled with ineffective discipline are often seen as factors that inhibit a child from learning control and self-esteem. It has also been observed that bullies tend to be more negative and perform poorly in school. Teasing has several different definitions, uses, and varying effects. When done in a positive and pleasant manner, teasing can help foster strong relationships by way of showing affection and closeness with another person. Children often tease as it can be a playful way of getting someone’s attention, usually to get teased themselves. 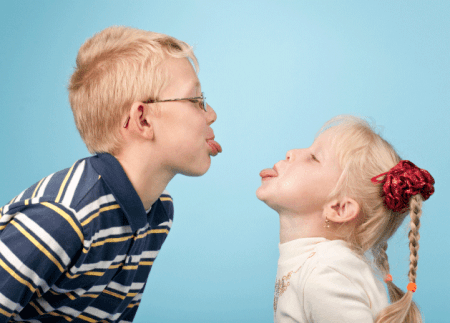 Teasing can also be a friendly way of telling someone what behavior is socially accepted. Gently teasing a child about talking while his mouth is full is a positive approach to telling him that doing so is not proper behavior. Teasing can also serve as a non-threatening approach in resolving conflicts as it provides an outlet for expressing disapproval or frustration. Behavioral experts warn that, while teasing can be used in the most positive of ways, it can be misused to criticize, embarrass, and alienate other people. Teasing becomes confrontational when the one being teased becomes distressed due to the teasing. Physical appearance is important in social acceptance, and teasing someone about it usually hurtful and hostile. Therefore, teasing can be a slippery slope that can easily lead to bullying. Bullying is often viewed as an aggressive act usually characterized by hostile intent, an imbalance of status or power, and habitual behavior. Teasing, on the other hand, can be a positive behavior when it occurs between two individuals who see the teasing as affectionate. While bullying is aggression with the intent of dominating someone viewed as weaker or smaller, teasing done in a positive manner can help build healthy and happy relationships.